キラキラ輝く、すてきなHoliday Season。 クリスマスツリー、18選。Sparkling, nice Holiday Season. 18 Christmas tree 2016 in Japan : Happy Aging & Beautiful Anti Aging loving. It remains a little this year. 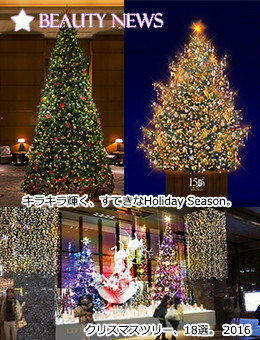 Today, pre Christmas, which ends the end of 2016, at the end of the holiday season,We will collect " Christmas trees " that can be enjoyed at popular spots in Japan and shine brightly.